AT&T Bold 9700 for FREE! Looking to get the new BlackBerry Bold 9700 on AT&T? Well, you’re in luck! LetsTalk.com is selling the BlackBerry Bold 9700 for only $9.99! Standard shipping is free. But wait, don’t pay the $9.99 when you can have it for FREE! 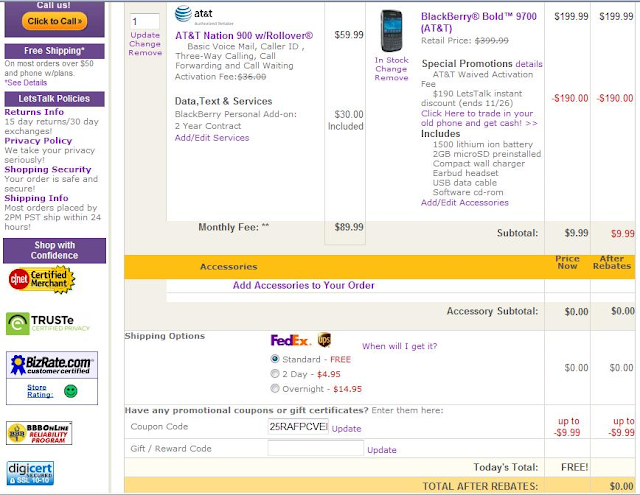 When checking out use promo code 25RAFPCVER1 and you will get the Bold 9700 completely free when adding a line or upgrading on AT&T. If you take advantage of this deal, let us know!